Lindinger Inspection Services is a global Inspection, Verification, Testing and Certification company. We are recognized and operated through a network of offices and trusted representative across globe providing highest quality and trust worthy services in Inspection & Energy Industries Founded in Dubai-UAE with focusing on Transparent & Trust worthy Inspection / Expediting Services to various clients throughout the Gulf. Mr. Chetan M. Sonawala joined Lindinger Inspection Company, who is now the Managing Director of the company, opened the Middle East Operation (Lindinger Inspection Services) based at Dubai (UAE) in 2008. In 2012, Chetan opened Italian office, Lindinger Inspection Services S.r.l. at Ravenna, Italy. In 2009, Lindinger Inspection Services opened Lindinger Inspection Service Pvt. ltd. Mumbai, India. With a team having Vast knowledge in all types of Inspection and survey techniques. Lindinger Inspection Services, started expanding their business in India, Bangladesh and SriLanka. They could find a suitable person who was working with a French Inspection & Certification Company in the capacity of Quality & Compliance head. Mr. Suresh, has accepted the challenge, and now leading LISPL. Mr. Suresh, have plus 30 years wide experience in all the field of Inspection & Certification such as Agricultural, Minerals, Industrial, Consumer Goods, Petroleum & Petro Chemicals, Chemicals, Quality Management Systems, Laboratory Testing. He also posses many other titles in HR, Administration. He is also a Fraud Investigation expert, a Trainer of Business Ethics and moreover a proven Team Player and a Leader. Lindinger is one of the fastest growing Industrial Inspection company in the Gulf region & Indian Subcontinent, serving some of the largest projects in refinery, oil and gas, constructions etc. Lindinger name is synonymous to Quality, Reliability, Precision, and last but not the least, a Great Value for Money! Lindinger has till date provided its services, and inspection personnel to many organizations, which include some of the fortune 500 companies. What sets Lindinger services apart, is the processes and methodologies followed internally, and the utmost care we take in filtering, selecting and recruiting our personnel. Lindinger has its presence in USA, Mexico, Italy, Netherland, UK, Spain, Turkey, South Africa , UAE, Kuwait, Oman, Qatar, Saudi Arabia and India with offices in multiple cities. We are extremely pleased to introduce ourselves as an International Independent Inspection, Testing and Certification Company. The core activity of Lindinger is Inspection Services in the areas of Pressure Vessels, Piping, Transformers, Tanks, Heat exchangers, Mechanical / Electrical and Instruments inspections. 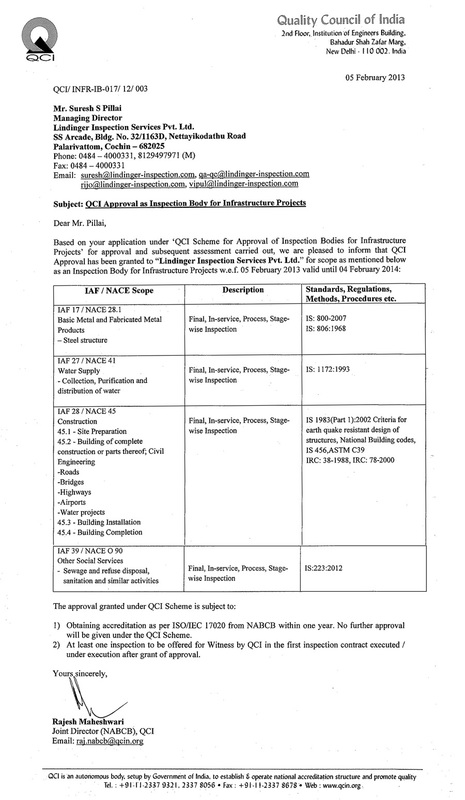 The activities also include monitoring of trade and shipments and Testing and Certification of Raw Materials, Agricultural Products, Processed Food and Beverages, Tea and Coffee, Metals and Minerals, Ores, Organic and Inorganic Chemicals, Petroleum, Petro-Chemicals, Fertilizers, Dyes and Intermediates, Drugs and Pharmaceuticals, Engineering Goods, Consumer Goods, Industrial Equipment, Food and Dairy Products, Vegetable Oils and Fatty Acids, Waters, Environmental Assessment, and a legitimate trade facilitator etc. In addition, specialized services are offered in import/export verification, Industrial and marine investigation for P & I Clubs and underwriters, loss minimization, stock management services, custodian and warehousing services, damage assessment of marine vessels and equipments, blending and introduction of additives/dye in marine liquid cargoes, pre-erection and post-erection inspection of machinery, plants and industrial equipment. In the field of inspection and analysis we have remained independent and factual and our standard of service is unrivaled, in spite of stiff competition. We offer our services throughout the world, through our branches and associates and have experienced and qualified personnel trained to serve our clients. Our Clients are updated regularly by most modern means of communication, keeping in view their individual requirements and ensuring the protection of their interest. Our Vision is to reach out to every part in the world and expand our services to various domains, using our standards, and become the most trusted name in Quality and Inspection. At Lindinger, our mission is to strive for the highest standards in quality, and to achieve 100% customer satisfaction. The mission is to keep on intensifying our processes whereby all our operations world over retain the same measures for quality, accuracy, and service levels! 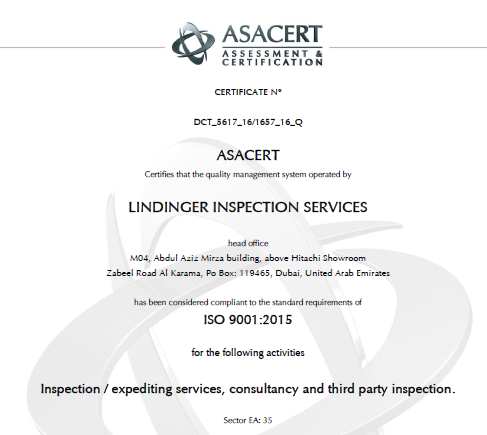 2008 – Opened LINDINGER INSPECTION SERVICES office in Dubai.